The Rhode Island Departments of Environmental Management (DEM), Health (RIDOH), and Elementary and Secondary Education (RIDE) are enlisting the support of Rhode Island school districts to protect school children and their bus drivers from breathing excessive amounts of diesel exhaust emissions. The agencies, in a joint letter to all Rhode Island school superintendents, are asking the school districts to enforce State air pollution control regulations that limit school bus idling time and encouraging school transportation providers to replace aging diesel buses with cleaner, environmentally-friendly buses. "By shutting off bus engines immediately upon reaching destinations, and not restarting them until ready to depart, school districts can bring important environmental and public health benefits to all Rhode Islanders," said DEM Director Janet Coit. "Despite marked improvements in air quality over the past two decades, pollution from small particles in diesel exhaust continues to impact Rhode Island's environment and contribute to climate change and smog. Now is the time for school districts across the state to take simple, common-sense actions to protect air quality and the health of school bus riders and drivers by reducing exposure to harmful diesel emissions." 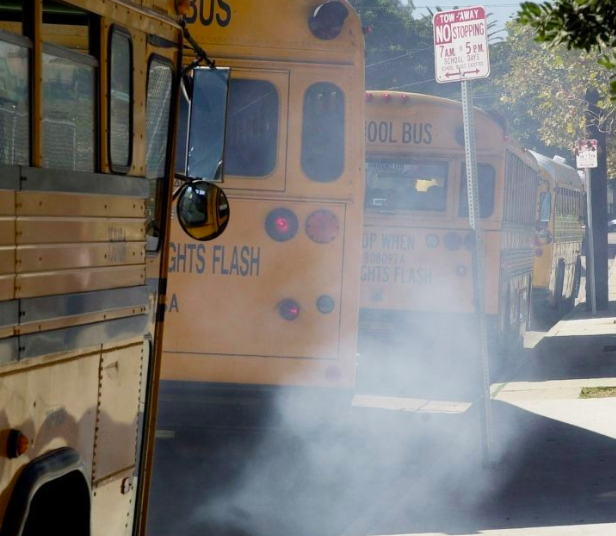 Diesel exhaust from idling school buses can pose a health risk to both students and the drivers. As school buses idle waiting for students, the diesel exhaust concentrates at ground level and can enter both the passenger compartments of the buses and the school classrooms through the building ventilation systems. Diesel exhaust is hazardous to human health, is carcinogenic and is particularly harmful to children and seniors. Tiny particles in diesel exhaust can lodge deep within human lungs, where they can trigger asthma attacks and stunt lung growth in children. Asthma is reaching epidemic proportions in Rhode Island and is the most common chronic disease in children, responsible for the most school absences in Rhode Island. "Health does not start in the doctor's office. Health starts in our homes, our schools, and the other places in our communities where we live, learn, work, and play," said Director of Health Nicole Alexander-Scott, MD, MPH. "We know that regular exposure to high levels of diesel emissions can have serious effects on respiratory health, especially for people with underlying conditions, such as asthma. By replacing aging diesel buses and limiting idling time, school districts throughout the state have an opportunity to create safer learning and work environments for their students, drivers, and school personnel. Changes such as these are critical to the health and well-being of our communities now, and for generations to come." "At the same time that we look to make record investments within our school facilities, we must also commit to protecting school environments as a whole. Both inside and outside of our school buildings, we want our students to be healthy and safe, and to feel like valued, supported members of their school community," said Ken Wagner, Commissioner of Elementary and Secondary Education. "This small shift can make a big difference in air quality, and on the health of our students, educators, staff, and families." School bus idling also wastes money. On average, an idling vehicle burns one gallon of fuel per hour. Idling can also increase wear and tear on the engine, resulting in greater maintenance costs and reducing the life of the engine. DEM'S Air Pollution Control Regulation No. 45, Rhode Island Diesel Engine Anti-Idling Program, prohibits the unnecessary idling of diesel powered vehicles and equipment. Under this regulation, idling of diesel powered vehicles is limited to five consecutive minutes in any 60- minute period, except as provided in certain exempt situations, such as when it is necessary to operate defrosting, heating, or cooling equipment to ensure the health or safety of the driver or passengers. A school bus may idle for up to 15 minutes per hour when temperatures are between 0 degrees and 32 degrees, and as needed when temperatures are below 0 degrees, to provide heat. A passenger bus may idle a maximum of 15 minutes per hour to maintain passenger comfort while non-driver passengers are onboard whenever temperatures are below 50 degrees. DEM encourages school transportation providers to replace aging diesel buses with newer, cleaner vehicles. Federal funding is available to public and private fleet owners for replacement of old diesel school buses through the School Bus Rebate Program. More information on this program is available at https://www.epa.gov/cleandiesel/clean-diesel-rebates. For more information on the state's anti-idling efforts and rebate programs, contact Allison Archambault in DEM's Office of Air Resources at 222-2808, x-2035 or at Allison.archambault@dem.ri.gov.